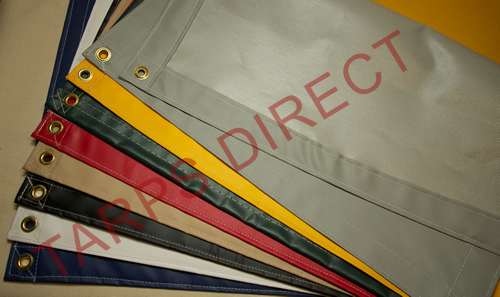 Tarps Direct's 18 oz Vinyl Laminated Polyester tarps are flame-retardant, waterproof, UV and tear resistant. Common uses include canopies/tents, paint booths, gym floor covers, inside room dividers, triage tarps, firewood covers, salvage covers and any other applications that require a durable flame-retardant tarp. Rustproof brass grommets are located in corners and approximately every 24 inches on all four sides.